Alice Cooper is a game that has been created with inspiration from one of the more well-known singers of our times, hence the title that it uses. The game has been created by Leander Games and it is trying to convey a feeling of almost horror, at least based on what we’re seeing on the reels. The images do look like they are borrowed from a horror movie, especially if you look at things like the logo that is made out of dripping blood, the presence of skulls in some of the symbols, or of hearts that have daggers going through them. There aren’t a lot of options that are themed on those reels, the majority appearing to come in the form of poker cards that have slightly irregular shapes to them, just like any letter in a horror themed game would be. Leander Games is a company that is based in Argentina, with its headquarters being located in the city of Buenos Aires. The developer has been offering slot machines for a while now, with about a decade passed already since they were established. They offer 40+ slot machines as of right now, and they continue to create new ones, some of them quite interesting, just like Alice Cooper is. By accessing the menu area, you will get the option to modify the Total Bet. The starting point is at $0.20, while the maximum value allowed will be $80. For 20 active lines, this would mean that the line bet varies between $0.01 and $4. 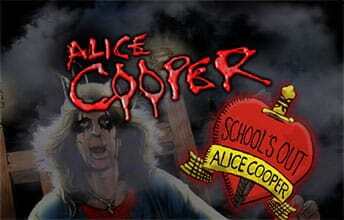 The mobile friendly design of Alice Cooper means that you don’t have too many buttons crowding the screen. There is the Spin button and the Autoplay option on the right, with the Menu button on the left, and that’s about it for the relevant ones. Scatter symbols are often present in slot machines, and they typically have a role that is associated with the start of the bonus game or of free spins. It’s the latter that we’re getting from the Snake Bonus symbol in this case. You are required to first have a minimum of three such symbols in view on the reels, and obviously it’s not important where exactly they land, provided that they’re all present. Twin Wilds are also offered among the game’s features, and I found them to be quite interesting. They appear stacked on two reels at a time, and they can be of great help to you. Used as substitutes, the wild symbols are sporting the images of two eyes with make-up on, sporting the look that Alice Cooper would use. Another feature that is available in Alice Cooper is the one called Death Row. Triggering it is possible with the assistance of five School’s Out Hearts, the ones with daggers going through them. If you have only three or four symbols, then you get only cash prizes out of the game. The symbol with Alice Cooper is going to offer the best prize in this game, paying 200 coins when five of them occupy an active line. This means that you can expect a jackpot of $800 from it. Alice Cooper provides us with action that revolves around one of the more eccentric and loved musicians of the 20th century, and it does a good job at turning him into a branded slot machine.